And what exactly makes these stuffing muffins southern style anyway? In our experience, when stuffing, or dressing, as it’s sometimes referred to in the south, is made with a cornbread base, it’s southern style. And did we mention that these muffins are plant-based, vegan, with no refined oil or sugar and they’re also gluten-free? You’ve landed yourself smack in the middle of stuffin’ muffin heaven, baby! What on earth compares with the intoxicating aroma of homemade food for a holiday meal? When these savory, Southern Style Stuffing Muffins bake, the house smells like every fantastic holiday dinner ever. The scent reminds us of the holidays even before that fabulous November when we decided to live a vegan lifestyle. We think the lovely smell is due to the beautiful combination of sage, corn, celery, and onions. There’s nothing like it! Sage has been used medicinally for forever, well practically. And sage treats inflammation, which is said to be the root of all disease. Sage can treat many illnesses that arise out of inflammation. Even though chewing on sage leaves is not always the most pleasant taste, as the flavor can be quite intense, eating sage is the most effective way to get the organic compounds acting in your system. Steeping sage leaves can also do the trick. So, if you suffer from inflammatory issues, particularly in the respiratory or gastrointestinal tracts, you can help eliminate that inflammation with sage tea. And the anti-inflammatory qualities of sage also address health concerns such as arthritis and gout, as well as general inflammation of the cardiovascular system, which can result in heart diseases and high blood pressure. In conclusion to this rambling cheer for sage: sage is more than just a great smeller, sage is good for us! To read more about the attributes of sage, read this article. 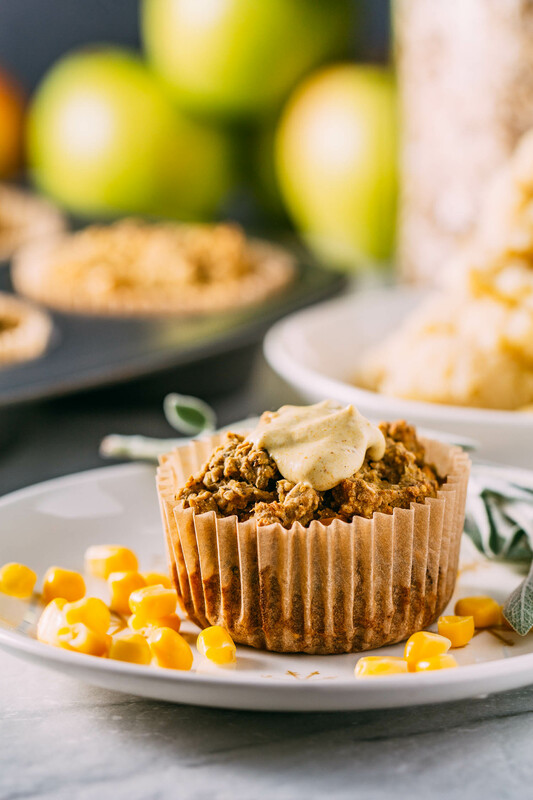 So let’s get down to what we want to convey about these delicious and gluten-free Southern Style Stuffing Muffins; their incredible flavor! Our Southern Style Stuffing Muffins taste like home feels. 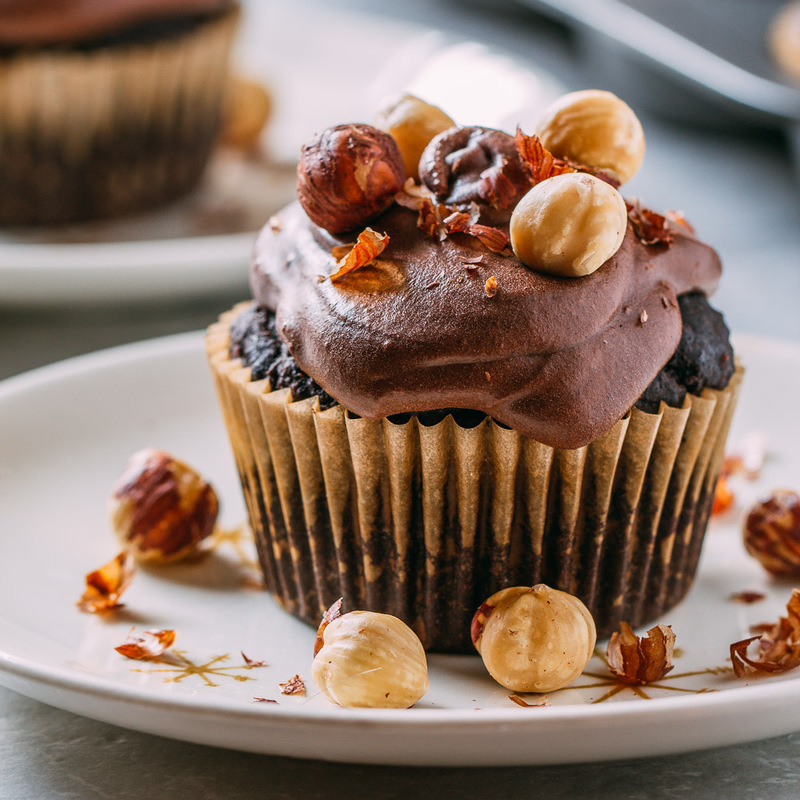 These muffins combine all of the favorite ingredients and flavors of every cozy holiday winter meal you’ve ever enjoyed. We enjoy eating these Southern Style Stuffing Muffins with mashed potatoes and gravy more than words can describe. And we’re confident that you’ll enjoy devouring these muffins this way too. They also taste fantastic with our 1-Bowl Raw Cranberry Fruit Salad. And in case you’re eyeing that little dollop of golden goodness atop the muffin in the first photo, that’s our homemade oil-free mayo with a pinch of curry powder and turmeric for color. Our little creation tastes terrific with these scrumptious muffins! So, PIN this recipe for safe keeping and share it with dear friends and family… you’ll want to find it easily for years to come… maybe even forever, like sage. 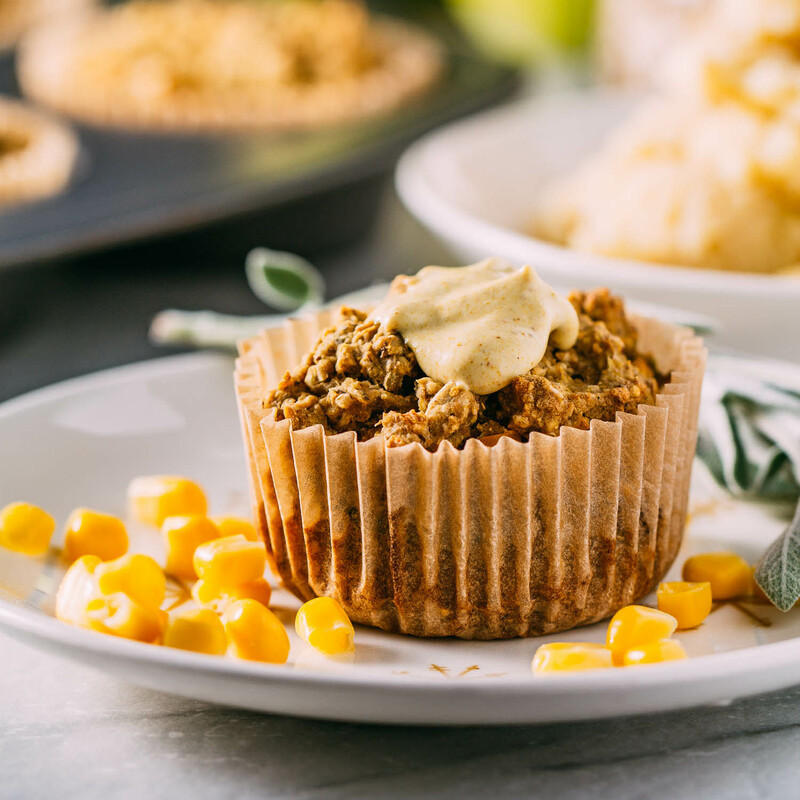 When you’re looking for that gluten-free cornbread-based stuffing recipe to wow all of the other holiday sides on the buffet, bake a batch of Southern Style Stuffing Muffins. Southern Style Stuffing Muffins are the perfect way to serve your stuffing in a new, casual, handheld way. Since muffins are conveniently portioned out, serving these is a breeze, and clean-up, too! Don’t be scared by the long list of ingredients. This recipe is a combine all of the wet stuff, mix the dry stuff, stir it all together and bake, easy recipe. This batch makes about a dozen and a half Southern Style Stuffing Muffins. You can even make these ahead, and they make fantastic leftovers… gotta love that! 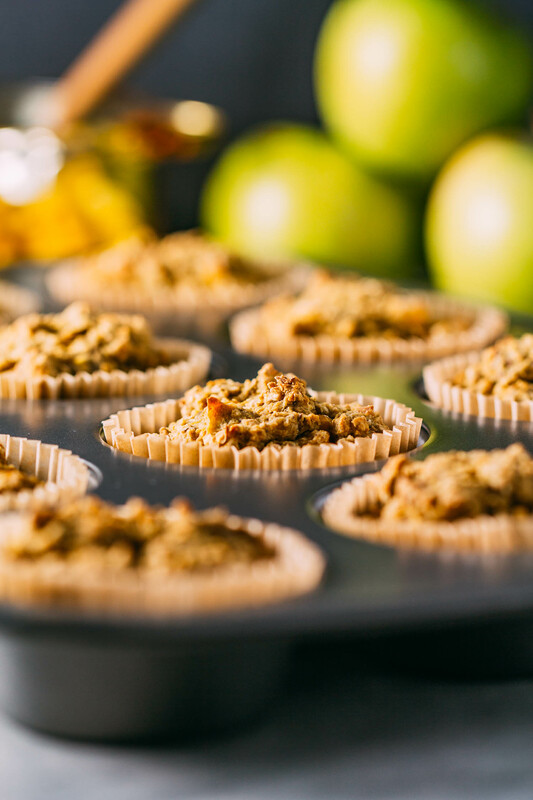 3/4 cup of apple, cored and chopped in a food processor - You can also opt to use the same amount of unsweetened applesauce. 1/2 cup of old-fashioned oats - Make sure to use gluten-free oats if gluten in an issue. 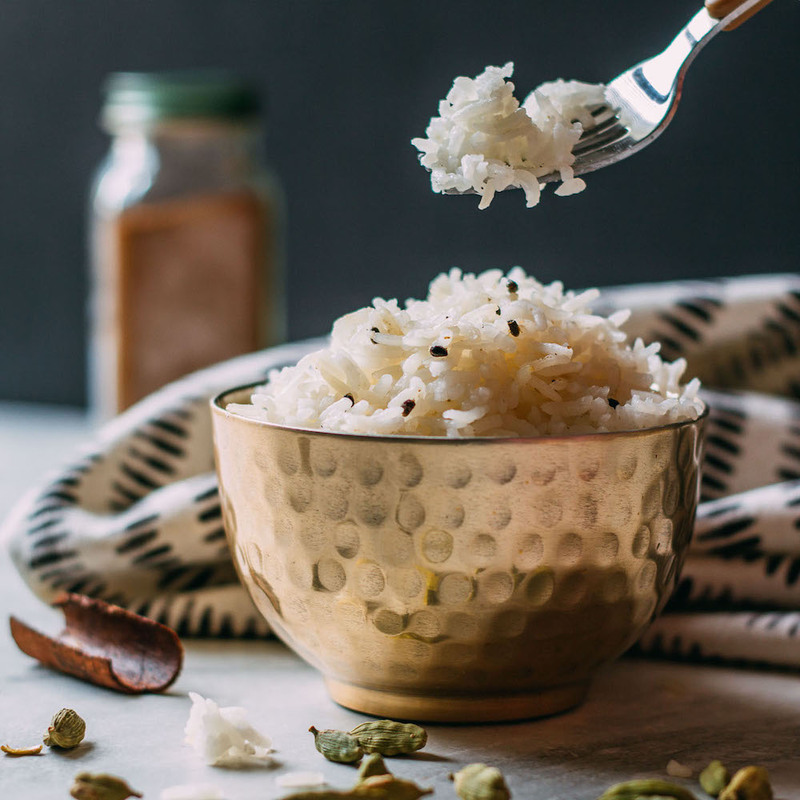 1 cup of almond meal or flour or oat flour - If you're using oat flour, make your own oat flour by grinding old-fashioned oats in a food processor! 1 1/2 cups of finely ground corn flour or cornmeal - We like Bob's Red Mill Masa Harina. First, begin by preheating the oven to 375º Fahrenheit and line a muffin tin, or two, since this recipe makes 18 muffins, with parchment paper cupcake liners to keep things from sticking. To a warm skillet over medium-high heat, add a splash of the cup of veggie broth, celery, and onions and saute until onions and celery. Cook a minute or two and add the rest of the broth along with the sage, salt, and pepper. Remove from heat and set aside. The mixture should look a bit soupy. 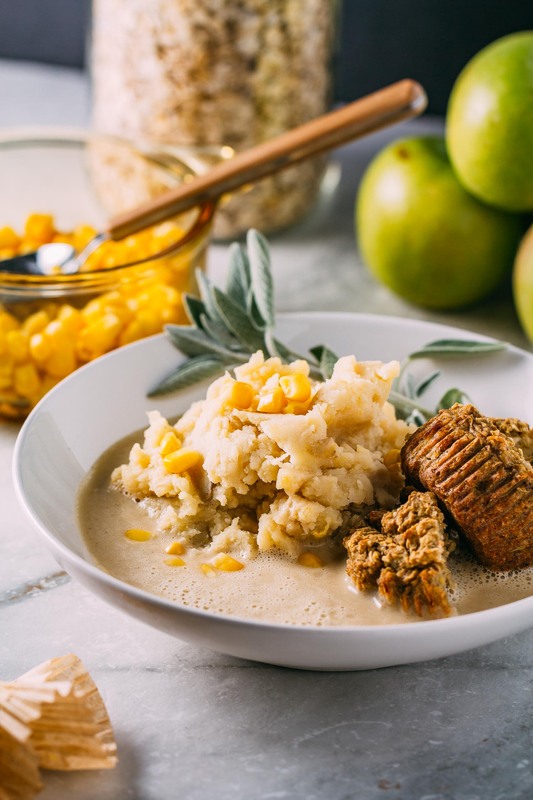 Next, in a medium-sized mixing bowl, combine the wet ingredients, including the ground apple or applesauce, flaxseed, unsweetened lite coconut milk (or other plant-based milk), vinegar (or lemon juice) and set aside. This unique combination creates a kind of vegan buttermilk and plant-based egg all at the same time! Now, in a large mixing bowl, combine the oats, almond flour (or oat flour), cornflour, baking powder, baking soda, ground sage, thyme and half-teaspoon of salt. Mix all of the dry ingredients to distribute everything evenly. Now add the wet ingredients to the large bowl of dry ingredients. Fold batter gently until combined; there's no need to overwork the mixture. Gently fold in the drained corn kernels. Scoop the batter, about one-quarter cup or so per muffin slot, into the prepared muffin tin lined with parchment paper cupcake liners. Bake for about 35 to 45 minutes depending on your particular over. Check for doneness by inserting a toothpick or knife into the center of a muffin. The muffins are ready to come out of the oven when the toothpick comes out relatively clean. On occasion, we've transformed our Southern Style Stuffing Muffins into a bit of a comforting Stuffing Dumpling. To do this simply roll a teaspoon-sized scoop of the batter into a ball shape and place on a parchment-lined baking sheet. Bake until slightly golden on top, about 20 minutes, flipping halfway through the cooking time. To check for doneness, gently insert a toothpick into the center of one ball; if the toothpick returns mostly clean, then they're ready to enjoy. We like to drop them into a hearty bowl of vegetable soup. You can also enjoy these as they are as a Mini Stuffing Muffin Biscuit Bite. As we mentioned above, we especially enjoy our Stuffin' Muffins with mashed potatoes and gravy. And they also taste fantastic with our 1-Bowl Raw Cranberry Fruit Salad. 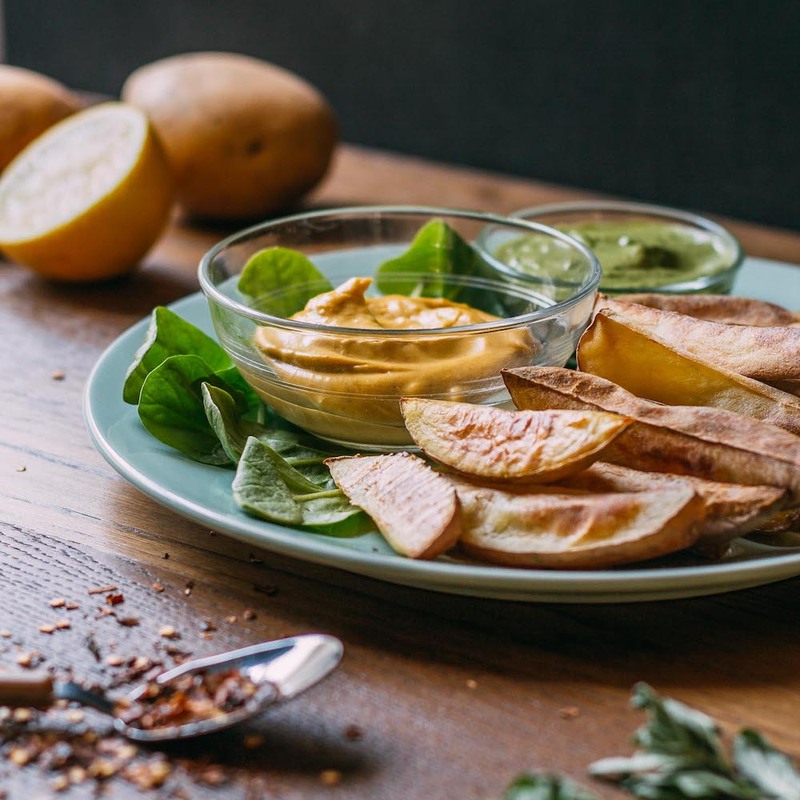 And if you're eyeing that little dollop of golden goodness topping the muffin in the first photo, it's merely our homemade oil-free mayo with just a pinch of curry powder and turmeric. The curried mayo is something that happened by accident and tastes terrific with our Stuffin' Muffins!